Do you want to truly connect with your teams and improve team collaboration? Do you consider innovation and collaboration key aspects of a successful business? At Paper Brush studio, we offer the most fun and creative workshops in Amsterdam. We notice how much of a positive influence painting helps our participants to bond and get to know each other better. We know that creativity sparks collaboration and communication, which are crucial aspects for your teams to perform. Below you can find various team building exercises and workshops that we are able to give on location at our studio in Amsterdam or at the location of your choice. These are just a few of our selected workshops that work well in-house as well as at an external location. If you have seen another workshop at our website of have questions about the list, please do not hesitate to ask. This is an introduction to watercolour workshop and one of our most wanted workshops! 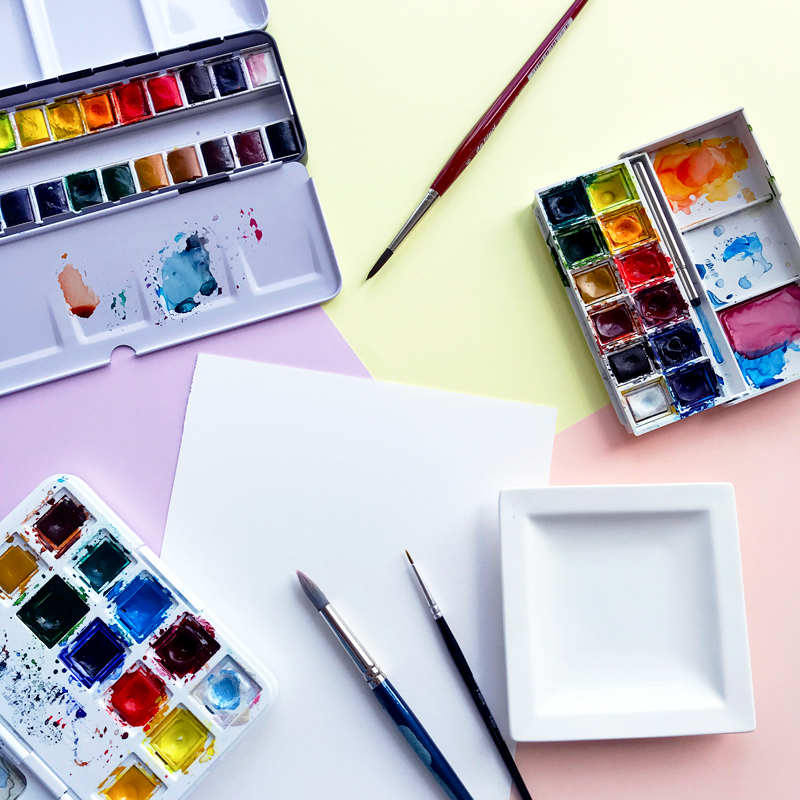 During these 2,5hrs you will learn the basic techniques of watercolour and with some guided exercises, the aim is to give you the tools to continue painting with watercolour at home! Welcome to the exciting world of black ink! A versatile medium and one of the oldest ones in history, black ink is incredibly fun. During this workshop you will learn how to use nibs as well as brush to create cool black and white illustrations. A sketchbook is a great place to experiment, record and enjoy time for yourself. This workshop is aimed at giving you tips, exercises and encouragement to keep a sketchbook habit on a daily basis. With already pages full of drawings from this day, you’ll just want to continue! We understand that some of our clients would like to have workshops for a larger group. If this is the case, we can either quote a space for you (we have a few options around our studio) or we can come to your work space and transform your ‘meeting area’ into a fun workshop space!